I'm Dave Wild, owner/operator of this small snag in the World Wide Web, with a number of items of interest. Light Up the Night - Temple Jazz Orchestra featuring Bill Watrous. --Information about The John Coltrane Reference, a massive work of scholarship by Lewis Porter, Yasuhiro Fujioka, Chris DeVito, Wolf Schmaler and David Wild (your tour guide), first released in December '07 by Routledge and reissued as a paperback and eBook as of spring 2013. --Updates to the reference, listing new finds and new issues and reissues. --An abridged Coltrane Discography (perpetually under construction, of course, with a little more than eight years on line). --Some details on recent Coltrane releases and other trivia, on the Coltrane News page. --Some shared recollections of Coltrane in performance on the Coltrane FirstHand page. There's also a page for saxophonist Ornette Coleman, rather limited so far, although it does have some details on recent appearances and reissues. We also have pages about my brother Ken Wild, an exceptional bassist and long-time first-call member of the Los Angeles music scene; about the Temple Jazz Orchestra, a remarkable ensemble based in Temple TX; and about yours truly Dave Wild, author, pianist and friend to man and beast. Music in these here parts is officially divided into "country" and "other", but the "other" includes some jazz--with performances by Dave Wild Trio, the S J Q (Swann Jazz Quartet), and the Temple Jazz Orchestra. We've included info on TJO's CDs with Bill Watrous, with Gordon Goodwin, and with originals by band members, among others. 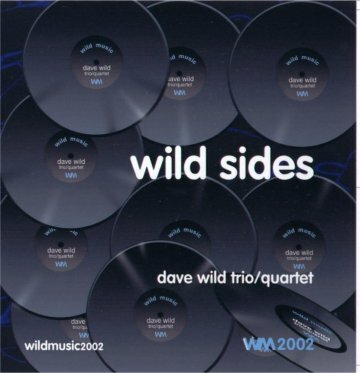 There's a page on my CD, Wild Sides --all these CDs are also listed at the Wildmusic Store. There's info about the Waco Jazz Orchestra. And there's a page with some performance listings for jazz in the central Texas area (including Dave, WJO, TJO, SJQ and a plethora of other friends, relatives and obscure acronyms). Finally, of course, we have the usual boring personal trivia. The old Virtual Homestead has been open for nearly twenty years now, and like your favorite Interstate highway, it's perpetually under construction. We make minor repairs when there's time after the chores, tweaking the prose, fiddling with the pictures, and putting out fresh odds and ends from the grocery store. But no matter what we do, we never really seem to get the mess straightened up. We're not too fancy around these parts, but most visitors aren't into bells and whistles anyway (reeds and percussion, that's another story). So please, ignore the clutter--feel free to wander around the place (just keep the refrigerator door closed). The guest book vanished in the last big move, but you can still send me email . This page was last updated on 1/20/16.